The Registry is a database that stores information about the system, including; installed hardware and its configuration, device drivers, network settings, installed applications and their configuration, and the configuration of each user's desktop. If you plan to maintain your own computer, you will need to become familiar with the Windows Registry. For example, if your computer stops while loading Windows and displays the mesage "Cannot find device", you will need to remove the reference to that device from the Registry. 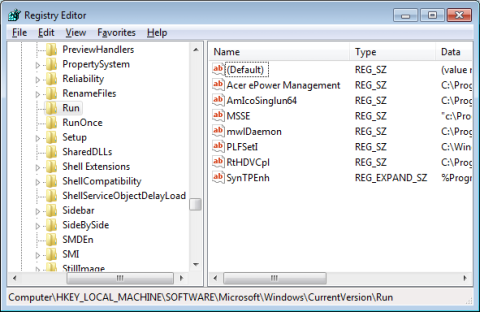 To open the Registry Editor, in the Start button's Search box type regedit.exe. In the Registry Editor window that appears, click the + sign in front of the HKEY_LOCAL_MACHINE key. This will open up the key and display a list of sub-keys. Open the subkey Software. This is the key under which software vendors should install their products. In the list of Software subkeys, open the subkey Microsoft, then Windows, then CurrentVersion, then Run. Note: Every key has one and only one value that is named "Default". A key may have any number of other named values, but you cannot delete the one named Default.